My son enjoyed his time learning to use a Japanese sword. The instructor was kind and patient. I have already practiced the movements on my own 10 times. It was fun, of course, but also surprisingly calm. Thank you, Takara! This was a fun rainy day activity. My boyfriend and I were picked up by Takara and one of his assistants and taken to a dojo. It was a nice alternative to the park because it was raining so much that day. 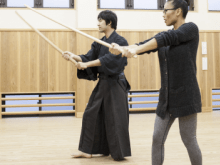 We practiced with wooden swords: breathing, movements, footwork, focus and arm swings. It was a good introduction, but we wished we had more than an hour to get more into it. It was quite special at the end to hold a real 500-year-old sword and look at how it is made and put together. Takara's English is very good, and the lesson felt genuine (not a tourist gimmick). Thanks! Master Takara's teaching assistant, Kato san was superb! His English is good, he expresses himself well and is also very patient. The only thing that's problematic is that some of the movements require what seems to me like complex arms and legs coordination; which I am not good at. Nevertheless, Kato San realizes my struggles and teaches me techniques that I can manage, making the class an enjoyable and memorable one for a novice like me. I would highly recommend Master Takara's class to anyone who would like to experience Japanese traditional swordmanship. *(Note: the photos were taken after the class ended with me and Kato San striking a pose with his katana. During the class, a wooden sword is used instead).... Thank you Master Takara and Kato san for such a rewarding experince!! This was an excellent activity to do in Tokyo. Our host and his assistant were both professional, friendly and helpful. They really gave us a taste of traditional sword skills during the 2 hour private lesson. We happened to have our lesson outside in a park which just added to the atmosphere. I highly recommend this activity and will be sending all my friends here. The lesson is reasonably active so don't wear clothing that is overly warm!